RCGS has over 6,285 genealogical resources and is growing. Clicking on the Eye to the left of the title provides more information. The Kansas collection of 1, 667 items includes books, films and maps on all 105 counties. The remaining collection represents every state except Hawaii, foreign counties, geographical regions and subject specific items, i.e. Passenger Lists, Immigration/Emigration. 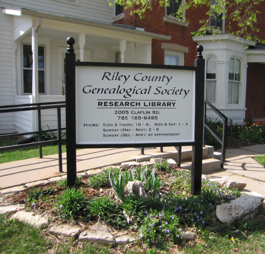 RCGS has over 1,363 published genealogies, with emphasis on Kansas and Riley County. The RCGS inventory includes both print and microfilm records of Riley County Probate Records, Wills, Naturalizations, Marriages and Vital Records, from 1856 through 1939. These are digitized for a surname search. All Riley County and Manhattan cemeteries have been read and published. Churches, schools, and towns for Riley and adjacent counties are represented with local histories. Our Newspaper Abstracts provide birth, death, marriage information both on-line and in print form. Print and microfilms exist for Riley County censuses from 1855 Territory through 1930. RCGS helps with Ancestry.com, Heritage Quest Online and Family Search.org for censuses and research.